Curtains are a necessary expense that we all have, and sometimes the acres of fabric required can easily swallow up the majority of your decorating budget. But, do not fear as there are ways around it, from choosing a style of curtain that needs less fabric, making your own, to finding the best place to buy cheaper fabric. I've also included some cheats and tips to help everyone out, no matter what their sewing experience; for example, did you know the way you hang your curtains can make all the difference? 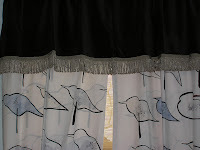 A great way of how to save money on curtains is by making your own. You have complete control over color, style and the ability to create the perfect fit for your chosen window. So what if your chosen fabric is so perfect for your decor that you just can't live without it, but it costs more than your budget can handle? Seeking out styles that use less fabric is a handy solution around this problem. Most of these ideas are a great modern alternative to the more traditional curtain styles, with the added benefit of being easier to make too. Cased heading curtains use only twice the length of fabric to the width of the curtain rod, compared to 2.5-3 with traditional pencil or box pleat curtains. 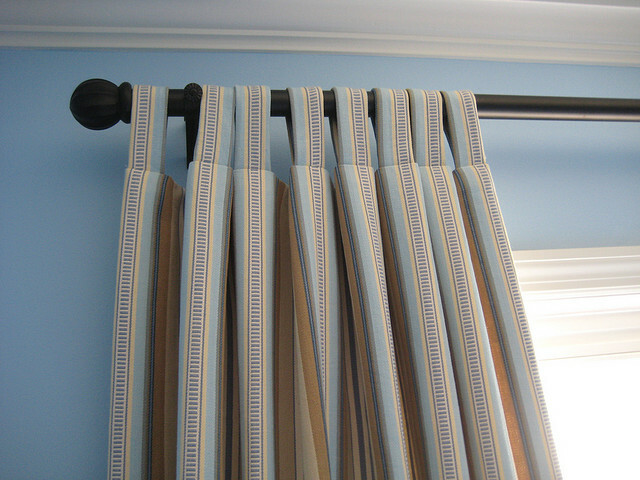 A cased heading curtain is simply a wide hem stitched at the top, wide enough to fit over the curtain rod, and the pleats are adjusted directly rather than using header tape. 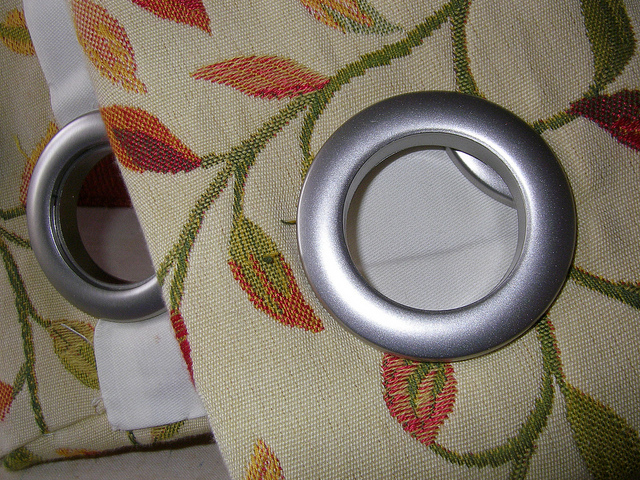 Eyelet headings use only twice the length of fabric to the width of the curtain rod too, and are easy make. Large size eyelets are set at the top of the curtain, that then get threaded directly onto the curtain rod, again no need for header tape. 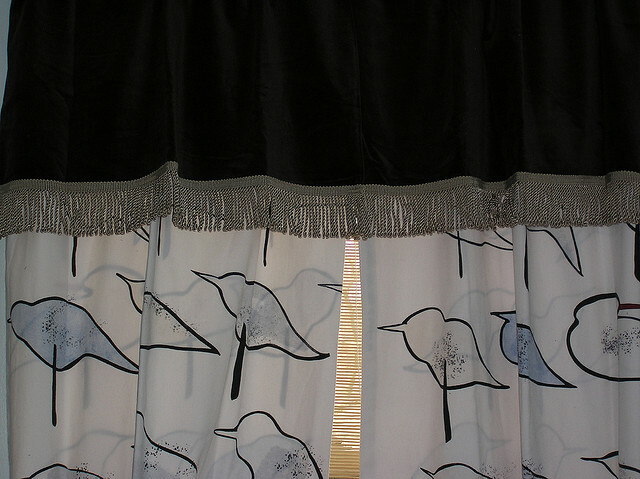 Tab top curtains again, only need a fabric width of twice the curtain rod measurement. They are attached to the rod by fabric tabs that can be embellished further with the addition of large buttons. Forego curtains completely and use the idea of a valance or pelmet with a window blind. This softens the window, and edge of the blind, adding more luxury than just a plain blind. If you aren't gifted in the sewing department then learn how to save money on curtains, by buying plain ones from the store, and adjusting them according to your needs. Dye them to suit your room's color scheme using a washing machine dye. Add simple embellishments like sequins, embroidery, tassels, fringing, appliqué details, or a contrasting strip of fabric. Also try using ribbon and attach using an iron-on adhesive. You could even use a sewing machine and randomly stitch a pattern over the fabric using a flat or zigzag stitch. Buy two cheap pairs of curtains (or use two you no longer use) and sew them together either vertically or horizontally. Or, again using two pairs of curtains cut one pair shorter and attach over the top of the longer pair creating a curtain and valance in one. Hang a DIY Roman shade, or ready-made roller blind - and add a fake curtain either side of the window. Fake curtains are just a thin strip of fabric used to create the illusion of full curtains, but don't actually move along the curtain rod. Use a shorter style - whilst floor-length drapes might look great in a living room, they aren't always necessary in other rooms like a study, or kids bedroom, or where there's furniture right underneath the window where you don't see where the drapes end. Use sheer fabric and less of it - if it's a room that doesn't demand a great deal of privacy, like a dining room, this is an easy style to pull-off to make big savings on your home decorating budget. There are many places on the Internet that offer special deals on "end of roll" or "last season" fabric, that have proved to be a great money-saver. A well known auction site is a good place to look, but you really need to take special care when viewing the pictures, as you are reliant on them being a true reflection of color, and you have no idea of the quality. The other danger is that if you have made an error in your calculations and realize you don't have enough fabric you aren't going to be able to get any more. Seek out fabric warehouses in your area, for great deals too. Reputable retailers will always be happy to provide a fabric swatch for you to take back home to see it if matches with the rest of your decor, and if you are buying a large amount of fabric that isn't end of roll they may be happy to do you a deal. Or you can seek out which rolls on the racks aren't as full as the others, i.e. nearing the end of the roll, and approach the retailer then to see what price they can offer on the remaining fabric. These ideas should ensure that in decorating at least, you know how to save money. Curtains are a key feature of any room, so make them a talking point by using these tips and your own creativity.